As we drove along the A5 into north Wales, raindrops began to fall against the windscreen. Pete smiled. Phil started dancing. It was going to be a good trip. At nine o'clock on Saturday morning, Tania asked a dark bunkhouse room whether her clock was broken, as it said 9am and weren't we supposed to be up at 7:30? In fact the arctic temperatures of an unheated bunkhouse had frozen all the alarms. Everyone still managed to crawl out of their sleeping-bag-and-thermal cocoons quickly, with the lure of good paddling and (more importantly) a hot breakfast. 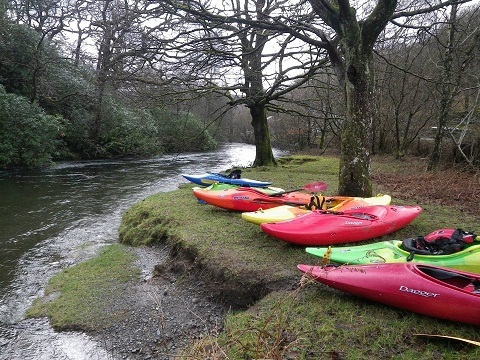 Saturday's warm-up was getting everyone's decks on at the top of the Glaslyn (medium to high, 1m on the Beddgelert gauge). Paddling across a flat lake with a severe head-wind to get to the start meant we were very warmed up indeed. Two groups headed down river. Pete's group showed the meaning of speed, and got to wait for some time for Phil's group, which had stopped to walk back and do the grade 3 boulder garden again. 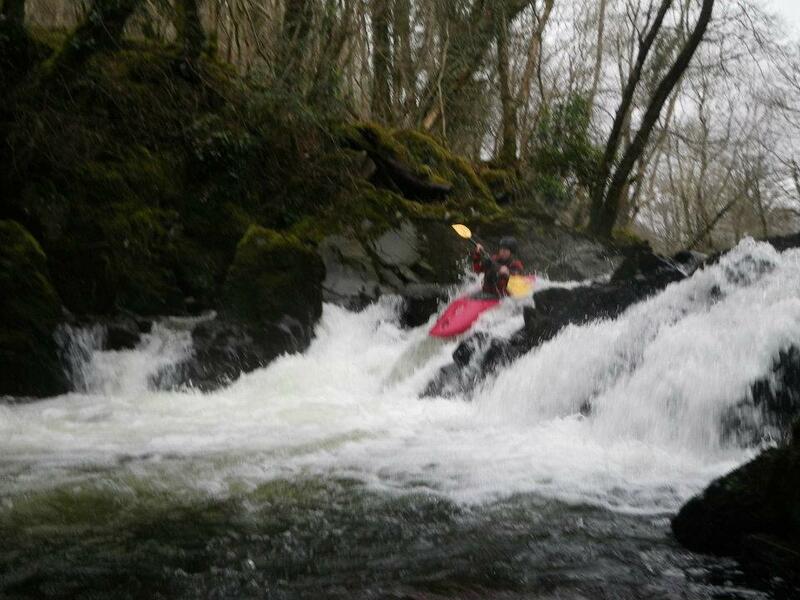 After this positive start, everyone looked at a highish Aberglaslyn gorge and decided not to run it. Instead it was in the cars and off to the Seiont (just enough water, 0.9m on the Peblic Mill gauge). This river is famous for some locals being less friendly towards paddlers, so we arrived and had boats on the water in record time. Nevertheless a local couple came out to speak with us, and pleasantly wished us a nice trip. The Seiont was a lovely continuous grade 3, mostly from a large number of drops. It was big enough for us to run as a large group, so Craig could stop wherever he could play then have to sprint to catch up. As the sun touched the horizon, we found ourselves sea-kayaking up to Caernarfon Castle. "Did you leave the cars by the slipway?" asked Phil. "No" answered Pete. "Ah" replied all. But throwlines are a good way of hauling boats up 3 metres of sea-wall, so all was well. Early to rise and early to bed, makes us all healthy but socially dead. But it meant that at 8:30 the next morning we were out in search of rivers via breakfast and gear shop. I don't quite remember the name of the day's river - it may have been Warsnip or Wotato. It was quite low, but enough to enjoy a scenic run through a narrow gorge section. Phil says grade 3+, but Sladden says 4, so that's what we're claiming. Two groups made their way down, peering round corners and eddy-hopping like 4-star trainees. The twists and turns kept us awake, and Olwen used the opportunity to see just how easily an edgy boat can be flipped by an awkward rock. Only Izzy in our group managed to glide over all the rocks without getting wet hair. We saw the front group ahead of us, and considerately gave them time to move on. When 5 minutes later they hadn't, we realised they were pointing at a large tree across the river. Brute force got us past it, and to the end of the river where the cars were waiting for us, intact. The trip wasn't quite over yet. There wasn't enough water for another river, but the road atlas showed that the delights of Welshpool were on the way home. And while every café there closes for Sunday, the pubs stay open, and we treated ourselves to a proper Sunday roast before heading home.